This post contains affiliate links. By clicking on and purchasing from those links you are helping to support my blog, and my family. Thanks for the love! I saw the Tidying Up with Marie Kondo show pop on Netflix after the first of the year, and truthfully felt very little motivation to watch it. I am not the pinnacle of organization, but I am a pretty tidy person. I throw things out all of the time (much to the woe of my family) and generally keep my spaces as clutter free as possible. But since my Netflix binge session of When Calls The Heart just ended, and seriously don’t get me started on how it ended (heart broken)…. I needed a new show. So I thought I would try one episode of Tidying Up. The after effect was that two episodes in, I decided my post-Christmas kitchen needed a little more “sparking of joy!” And so it began. 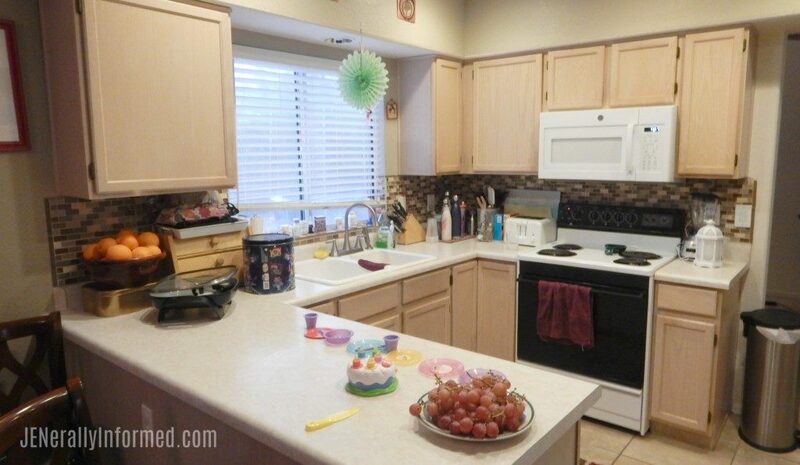 Here is a picture of my kitchen before I started the tidying up process. It’s kind of small, and we have plans to enlarge it, but because it is small, maximizing space is critical. What you see scattered on the kitchen is the detritus of Christmas. Oh, and the tea party plates are a reminder that there is a 5 year old Princess in the house. Not to scare y’all, but it got bad during the process. Like really bad. Marie said that was going to happen, so just to show the realness, here is a picture from right smack in the dab in the middle of the tidying up process. It might cause you nightmares….. It does have a happy ending though. I promise, so never fear! Here is what I tidied up! To begin, let’s talk about the problems in this space. 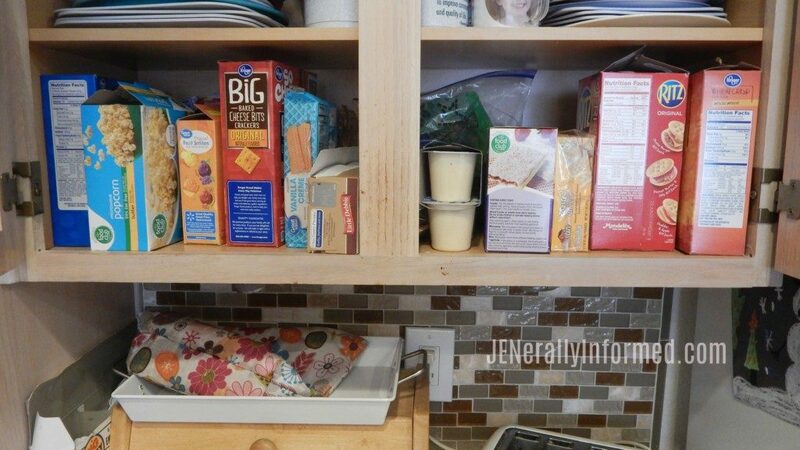 First off, did you see the breadbox on the far left side of the counter? 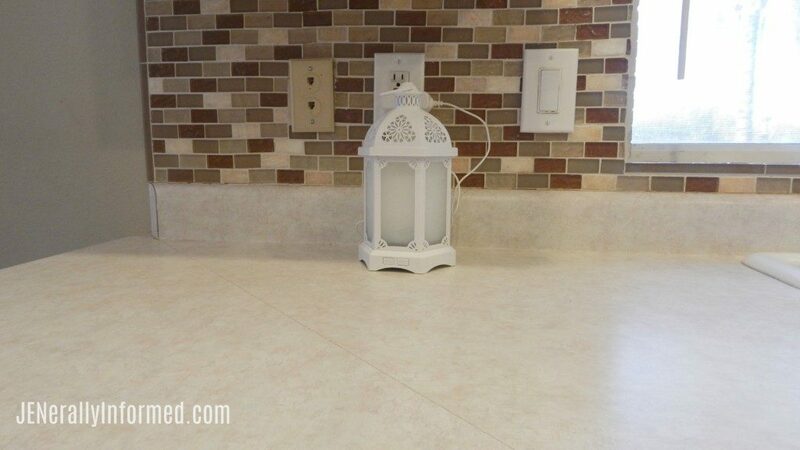 It blocks the electrical plugs for cooking and the switch to the garbage disposal. That does not “spark joy” for me. So here is what I did to fix that problem. I had a counter full of basically clutter. I cleaned it off and got rid of anything that didn’t spark joy. 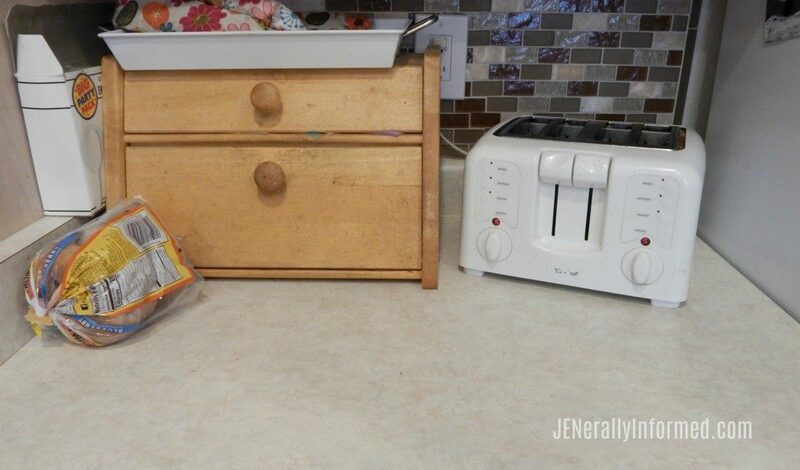 I moved the breadbox and toaster to that counter, and voila! Here is how it looks after. Yay, right! Plus on the others side of the kitchen I can now access my electrical plugs! And there is space for my fabulous new essential oil diffuser I got for Christmas. Another space that had been bugging me was our water bottle station. 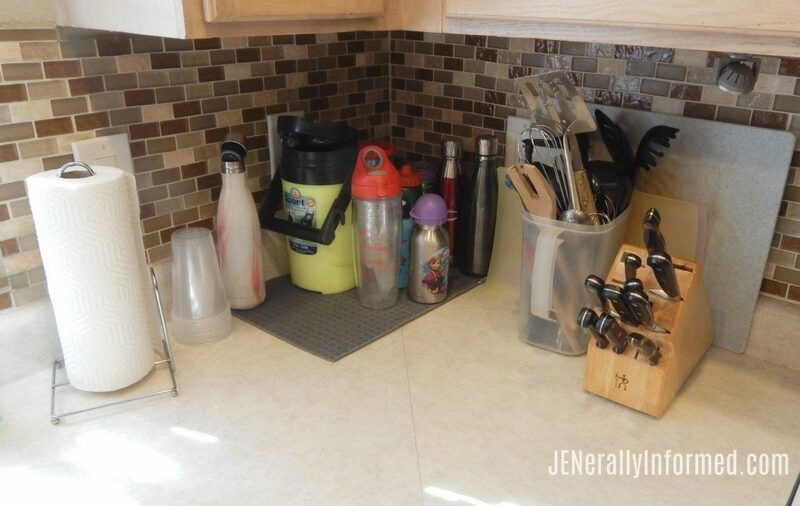 Since we live in the dessert we use these daily, but ours had become littered with old bottles we no longer used as well as having a counter that was constantly wet from the repeated washing and rinsing of said bottles, so here is how I fixed it! I said “thank you”, but good bye to all of the old water bottles and then added a brand new drying mat for storing the bottles. Next up was the pantry. How the builders thought a house with 4 bedrooms meant that only 1 long shelf pantry was sufficient is beyond me, but it is what we have for now. It really needed some organizing. I emptied out all of the contents, remember the scary picture? 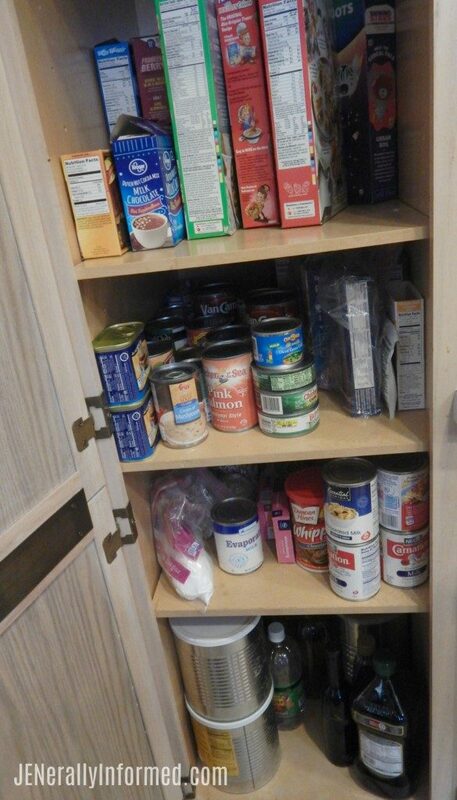 I said good bye to a lot of the contents and made stations within the pantry. 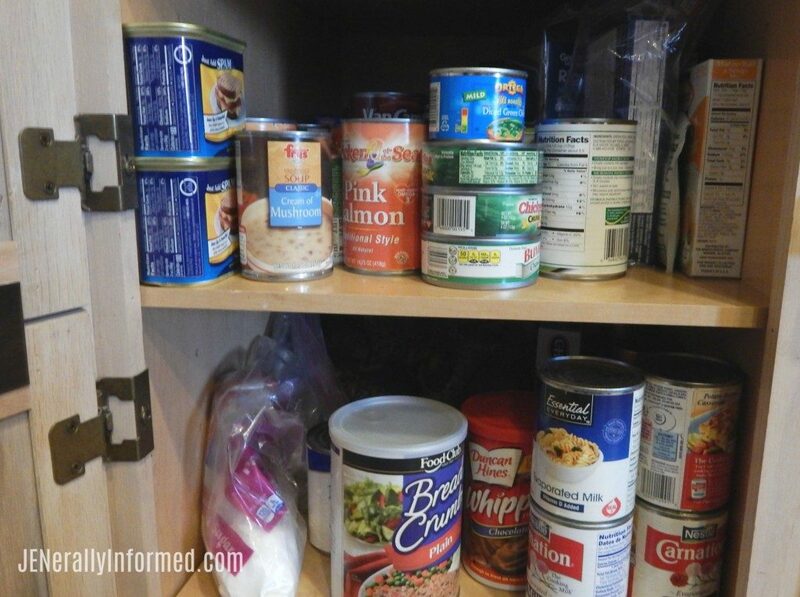 According to Marie, I should get boxes for within the pantry shelves and that still might happen, but for now thanks to my de-cluttering I realized I never need to buy evaporated milk again. And also, that because of the can of salmon I found, I now have a fun recipe for salmon burgers I want to share with all of you! This next space was something I had been wanting to do forever! 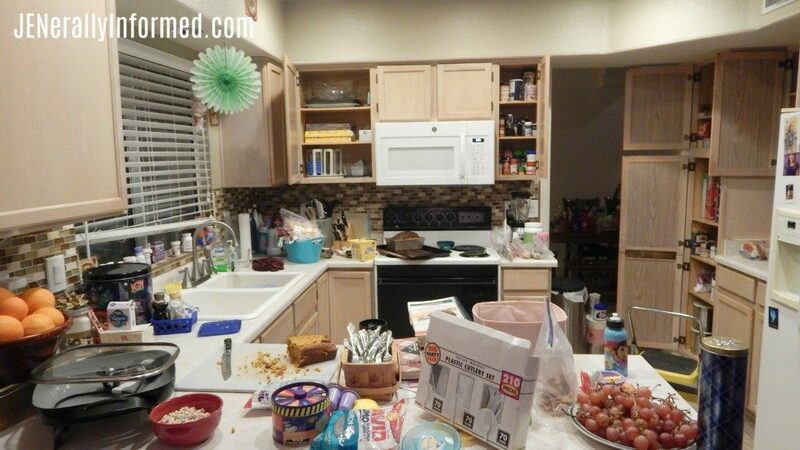 To create a designated snack area in my kitchen, but because with the accumulation of items that no longer sparked joy for me, it was all crammed willy-nilly into the pantry. And we had “mucho” duplicates of items, that is until now. Take a look! 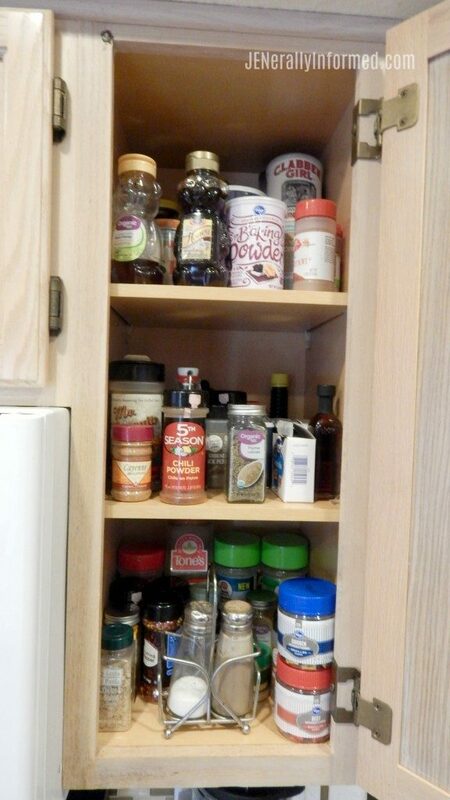 Lastly, here’s one more space that needed help -the spice cabinet. We cook a lot, and my husband is a spice master. Unfortunately, though our cabinet had become totally unruly and was littered with old and abandoned spice containers. Take a look at how it looks now! 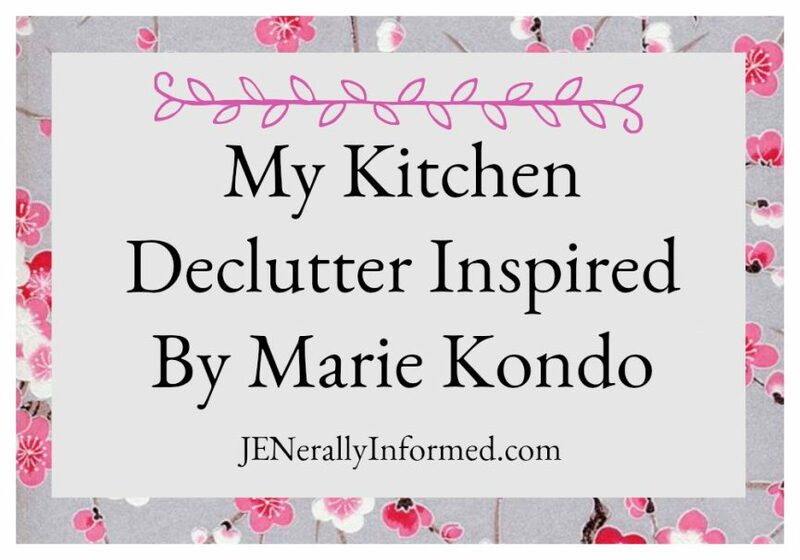 I know that die-hard Marie Kondo fans will say I didn’t exactly follow how she does things, but the end result is that my tidying up has brought me more joy, so the spirit of Marie is very evident in this project! If you would like to snag a copy of Marie’s book over on Amazon, click the image below! It’s easy to clutter any room, but if it’s a smaller room and you need storage it’s even tougher. We have a walk in butlers pantry that really helps us keep the kitchen counters clear. Or last place was cluttered because we didn’t have enough storage. I get it. I wish I had a butlers pantry, and so since I don’t, keeping the clutter out is the name of the game! Even doing the pantry must have felt great! I am even happy tackling a drawer or a shelf at a time. My linen closet is next! 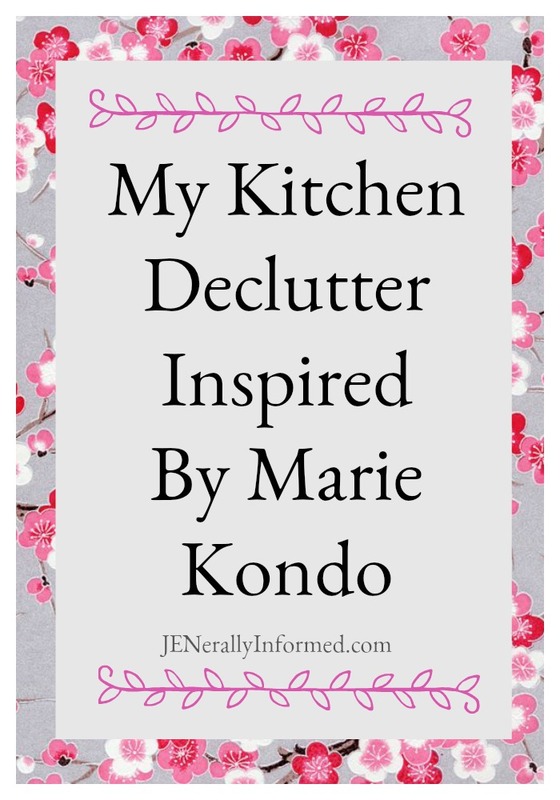 Hi Jen, I’ve seen the Marie Kondo series advertised on Netflix, but can’t bring myself to click & watch it. I’d probably end up hurling abuse at the television brought on by feelings of inadequacy. Saying that though you cupboards and work surfaces looked very much like mine do now, so maybe I’ll take inspiration from that!… You may think that you’ll never need to buy evaporated milk again, but be warned there was a time when I thought the exact same thing and when I really needed some for a recipe, I had none. Never again. I am back to buying it weekly and will probably end up having a cupboard dedicated to the stuff! It does look rather nice at the end. It made me breathe easier. Cassidy hasn’t seen the show but read the book and it’s so much part of his mantra anyway. He’s even gotten me a little convinced! Cleaning the pantry is always my job and I do it with gusto. Decluttering as an art form. Amen sister and thanks! Now to figure out what to do with all of the cans of evaporated milk…..
great job! I’ve just thrown out 6 large black bags of rubbish and gave away a ton of stuff! Feels like a detox!